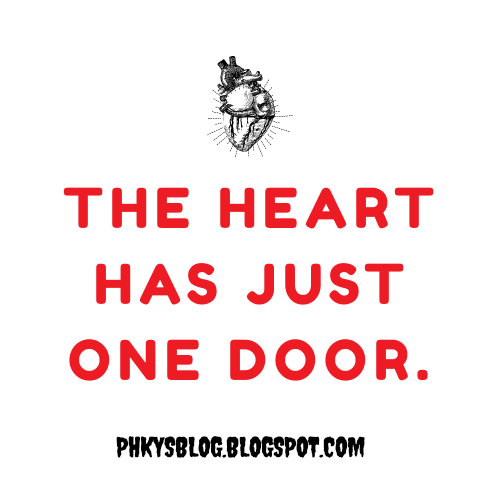 The heart has just one door. It is its entry and exit...ONE DOOR. It is the same door that ushered in pains that will usher in relief. It is from the same door that a bad relationship walked in that a good relationship will walk in. It is the same door that brought in grief that will bring in comfort. The door that brought in betrayal will bring in trust. The door that ushered in hatred will usher in love. Unbelief and faith will wall through the same door. Don't ever close the door of your heart because of your last experience. The heart has only one door and no matter what has come in, there's still a long queue of 'guests' behind the door waiting to come in. I keep me heart open.. No expectations just pure vibez and bliss.. Big ups!